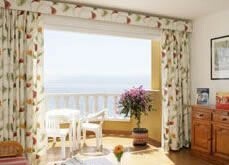 This lovely Barceló Varadero hotel is right by the La Arena beach in the south west of Tenerife, and is famous for the amazing weather all year round and the spectacular views of the Los Gigantes cliffs which can be viewed all around the bay. The hotel offers perfect settings for couples and families, and has a wide range of pools to suit every person- so the gentle swimmers aren’t mixed in with the playful kids! There are also some beautiful gardens surrounding the hotel to sit and relax in. If you’re wanting a bit of pampering on holiday, there’s a spa and massage parlour onsite and a babysitting service and kids club to keep the children entertained for the entire holiday. Every room has their own balcony or terrace and a satellite TV Connection to keep you entertained on an evening, during the day however the closeness of the beach and town will certainly give you something to do. A great all-round hotel with features to satisfy all of their guests, and some really good facilities that mean you’ll hardly want to leave this hotel at all!